The web page designed for AFS Exchange Students coming to our country. This web page has been designed for AFS Exchange students who are completing their exchange program in Latvia. We hope that you will use this website as a tool to get a better understanding of Latvia and everything that it has to offer! Let your experience begin here! Applying for an AFS exchange program i just the beginning of the journey that awaits you. Learning and embracing a new culture is in today's context considered as one of the most valuable tools. We as AFS help you prepare as future, active and global leaders by providing you modern day tools of intercultural learning. Going abroad is much more than just moving to a different country. It is about opening up to new people, getting to know them and their culture as well as sharing your own. This type of sensitivity raises student’s confidence when it comes to learning about new cultures and raising curiosity. During your time abroad, you will get to know yourself far more than you expect! You will create a better understanding of yourself that will benefit you in your social intelligence. Getting to know yourself, opening up to new experiences and adventures is something that will be inevitable during your time abroad! As exchange students, you become aware of life-long learning and it’s great impact. You will create a better understanding that learning can come from different places and that learning about a new culture and language can best be done in action! Latvia is a country in the Baltic region of Northern Europe. Since its independence, Latvia has been referred to as one of the Baltic states. It is bordered by Estonia, Lithuania, Russia, and Belarus, as well as sharing a maritime border with Sweden. Climate: The country has a temperate seasonal climate. The average Latvian families consist of parents and kids. The grandparents live in a different household. In Latvia it is possible to live in countryside without any neighbours and that is the dream of many Latvians. Latvia is rather neatly divided into two large groups: the indigenous Latvians, who make 62,1% percent of population, and the Russian native speakers, who make up 37,2%, so it is possible that during your exchange program, your family can belong to one of these large groups. What is common in almost every family is the love for spending time outdoors hiking, gardening, biking, collecting mushrooms & berries. Latvians call themselves “children of the nature”. Why does a family host an exchange student? Families in Latvia decide to host students because of their wish to learn about another country and experience the intercultural learning effect in first hand! The #AFSeffect affects us all! AFS Latvia volunteers explain the aims and objectives of the program to the host families and get to know the families as well before the arrival of the students. Your host family is not paid to host you but have agreed to take you into their home as a part of the family! Communication with your host family is key! In order to have a good bond with your host family, communication is very important! Therefore, showing your appreciation often in simple ways such as saying “paldies” (thank you) and participating in family activities. Don’t forget that being an exchange student does not mean that you are a guest in the host family, but a member of the family, therefore you are expected to take your share of the work and responsibilities around the house. Remember that this is an experience also for the host family and that everyone partakes in the experience of intercultural learning. The Latvian cuisine can be heavy, greasy, not at all spicy and usually quite simple. Breakfasts are usually something light, whereas lunch and dinner are heavier meals. Be ready to eat lots of potatoes, meat, fish and dairy products! During dinner or at a party, you will be able to try a variety of food and are expected to eat everything off of your plate, so only take as much as you can handle! In some cases, some may get offended if you do not eat their food as cooking is a way of Latvian hospitality. Tea is a very common drink in Latvia, often herbal, black and green tea. Sklandrausis is typical for the West of Latvia and is considered a traditional meal. Pelēkie zirņi ar speķi is often eaten in winter during Christmas time. Latvians enjoy eating this meal together with some other delicacies during the Holidays! School is going to be a very big part of your exchange program. This is where you will be spending the most of your day, where you will interact with other people your age, learn more about Latvia and continue your education. For many young people, school is a vital place of learning but also meeting new people. What type of school will I be attending? Typically you will be attending Vidusskola that is nearest to your host family’s house. 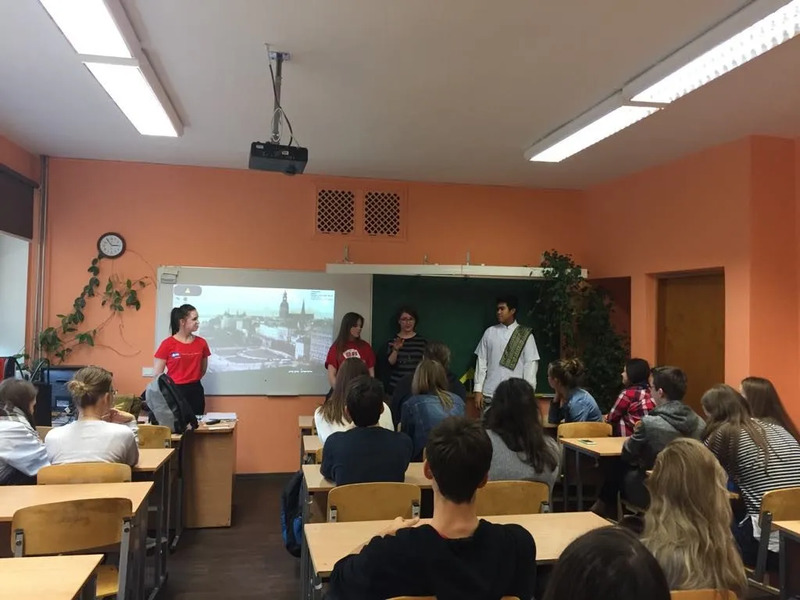 AFS students in Latvia study at high schools, lyceums, colleges and gymnasiums, but generally speaking there aren’t any major differences between these institutions. Their names can be different, but the content is more or less the same — all of them are high schools. Will I recieve credit for my year/semester abroad? Most Latvian students do not receive any credit for their year abroad. In spite of this, they generally have no difficulty readjusting and going on with their studies after coming back. This is usually also the case with those students who spend an AFS year in Latvia and then go back to their home countries. Going to school is a mandatory part of AFS school-based programs. You will get a certificate with grades, but getting a diploma is not guaranteed. What type of extracurricular activities do schools in Latvia offer? What type of holidays will I have during my school time? In Latvian schools there are four major school breaks throughout the year. The first one is the Autumn break which lasts for a week, Winter break which lasts for two weeks, Spring break which lasts for one week and Summer holidays that last for 3 months. On which dates will I have holidays in school? Classes typically start at 08:30 and one class lasts for 40 minutes. There is one big break during the day which is the lunch break which lasts typically for 30 minutes. In between classes, there is a 5 minute break that serves for the students to change classrooms for different classes. The school year starts on the 1st of September and lasts until the end of May. During your experience, you will want to learn more about Latvia through its music! Below you can find links to some of Latvia's most loved artists. Take a listen, you might find your new favourite artist! Latvia is celebrating is 100th centenary this year on the 18th of November. All types of celebrations are being organised throughout the country and it is a big part of the culture! With independence regained just over 20 years ago, it is naturally cherished. Symbols which are best left untouched are the Latvian flag, the Monument of Freedom and the national anthem. Latvians don’t joke about them, you will not find humorous merchandise featuring these symbols, they are respected in a good old-fashioned manner. Latvians know the value of freedom! During your exchange program you will be given the opportunity to take part in some excursions that are supported and suggested by AFS Latvia but not organised by us! Which means that you will be responsible to cover to cost of the excursion on your own. Below you can find more details. On the 20th of October 2019 there will be the option to go to the Latgale region in Latvia for 1 day. The price of the excursion is 35€ (euro) per person. On December 27th there will be an organised excursion to Estonia for 1 day. The cost of this excursion is 40€ (euro) per person. On February 16th, an excursion to Zemgale region Latvia will be organised for 1 day. The cost of the excursion is 40€ (euro) per person. April 13th you will be able to travel to Lithuania for 1 day. The cost of the excursion is 40€ (euro) per person. An excursion on June 6 until the 10th will be organised to St.Petersburg, Russia. Further information on the prices for the travel and visa costs will be reported and shared with you. Note that there can be changes made to this trip. What are some cultural traditions in latvia? Latvian customs and traditions are very unique in comparison to other countries. Engaging and following them will make your integration process more easy! Similar to Finland here almost every people in countryside owns a sauna in the garden maybe even with a small lake next to it. By the traditions first you hit yourself with birch tree branches inside the sauna and then run outside and jump to the lake or snow. Līgo is the most popular Latvian festivity. It originated as an ancient fertility festival celebrated after sowing the crops and before gathering harvest. People light bonfires, jump over them and celebrate until the sunrise. Name days: Every Latvian is happy to celebrate the day of their name, as marked in the calendar. Each day in the Latvian calendar includes up to four names, and there is a date – May 22 – to celebrate the names not included in it. 4th of May On 4 May 1990. Latvia proclaimed its independence from the USSR, and restoration of the Republic of Latvia. It is highly celebrated throughout the country as Latvians understand the price of freedom. The “White Table Celebration” is also done on this date. Families, friends and neighbors are invited to get together around a table, to share a jointly prepared meal, and to talk about history and future of their courtyard, neighbourhood, city, region and country. During your exchange you will be provided with a language course that is closest to your host city. If you are staying in Riga or in the capital area, you will be attending the language lesson in the AFS office, as for other students placed in different parts of the country, you will be informed where your course will take place. The language course is obligatory and will be held weekly. It is expected from you to show effort in learning the Latvian language and use these courses as much as possible for your language purposes. If you feel like impressing your host family and AFS by learning some Latvian before you come we can recommend this online app (Learn Latvian – Fabulo) available for IOS and Android devices, that can help you get a kick start of the Latvian language. Click on the link below to find out more! These set of rules are a combination of rules set by AFS that you are obliged to follow throughout the entire course of your exchange program. Should you disobey the rules, you will receive consequences for your actions, even by an early return. Regardless of whether or not you have a driver’s license during your exchange program, you are not allowed to drive! Drinking is strongly prohibited during the course of your exchange program. The legal drinking age in Latvia is 18, but regardless of your age, as you are a participant of the program, it still strongly forbidden. Any types of drugs are strongly prohibited not only by AFS rules but also the national Latvian law. A violation of this can lead to serious legal consequences along with an immediate early return back to your country. Hitchhiking can be very dangerous therefore we strongly prohibit it during the course of your exchange program. Getting pregnant or causing a pregnancy during your exchange program can result in an immediate early return as it is strongly prohibited by AFS. AFS is a school based program, therefore you are obliged to regularly attend school, do your school assignments as required and actively participate in class. Participants are not allowed to travel outside the country independently. They are allowed to travel only with AFS, hosting school or with their host families. Rule refers to all the students irrespective of the age. For all those cases the approval and Travel Waiver should be requested at AFS Latvia. During your exchange program, you will be covered by the AFS insurance. It is very important for you to read over the files to get to know what your insurance covers and entitles you. This will all be further explained during your arrival camp, however you will always be able to access the information on this website at any point of your program. Latvia is not a country where you should be afraid of something bad happening to you, but like in every country, we always advise students to take precaution in certain situations where they can avoid getting themselves into uncomfortable or dangerous situations. Below you can read some safety tips that we recommend for you to follow throughout your exchange. While you are in public transport or in crowded places, it is important that you take care of your personal belongings such as your phone, wallet, bag etc. Try to keep it close to prevent and pickpocketing that can happen in crowded places. The currency that is used in Latvia is the € (euro) and in many places in Latvia you will not be required to carry cash, but only use your credit card. In many restaurants/stores there is a sign where they will write if they only accept cash. Therefore carrying big amounts of cash is not necessary, and if you only carry your credit card, it will definitely be more safe than having large amounts of cash. Crossing the roads, being aware of bicycle drivers sounds like a typical rule that you should follow, but we want to emphasise the importance of obeying traffic laws such as not crossing the road on a red light, but waiting for the green light, as much as possible! Take the time that you wait for the green light, to enjoy the beautiful architecture around you! When in doubt - always ask! Moving to a different country is very exciting, but a lot of questions come along as well. Don’t feel shy to ask your host family about tips or advice about anything during your stay in Latvia. There are many things that you will learn throughout the course of your program, but the safest option is always to ask your host family, who will gladly answer any doubts that you might have. During your stay in Latvia, you will be able to access the AFS calendar where you can find information on which dates your camps and other AFS activities that you have to attend will be hosted. Please use this calendar to manage and organise your time beforehand and have all data in regards to when the camps and other AFS related activities are being hosted.